დაცვის სტატუსი / Protection status: ტერიტორიის 89.82%-ს კარწახის აღკვეთილი ფარავს. SPA 21-ის 87.04%-ს IBA (GEO17) ფარავს. IBA (GEO17) მთლიანად SPA 21-ში შედის. / 89.82% of territory is covered by Kartsakhi Managed Reserve. 87.04% of territory is covered by IBA (GEO17). 100% of IBA (GEO17) is represented by SPA 21.
დასაცავი სახეობები / Species of concern: ვარდისფერი ვარხვი (Pelecanus onocrotalus), ქოჩორა ვარხვი (Pelecanus crispus). (Javakhishvili et al. 2014). ტბაზე ვარდისფერი ვარხვის 50-100 და ქოჩორა ვარხვის 20-50 ინდივიდი ბუდობს. ორივე სახეობა საქართველოს ნითელ ნუსხაშია შეტანილი – ვარდისფერი ვარხვი როგორც მოწყვლადი (VU), ხოლო ქოჩორა ვარხვი როგორც საფრთხეში მყოფი (EN). IUCN-ის საერთაშორისო წითელ ნუსხაში მხოლოდ ქოჩორა ვარხვია შეტანილი, როგორც მოწყვლადი (VU) სახეობა. / White Pelican (Pelecanus onocrotalus), Dalmatian Pelican (Pelecanus crispus) (Javakhishvili et al. 2014). 50-100 White Pelicans, 20-50 Dalmatian Pelicans breed on the lake. Both of them are included on the red list of Georgia. White Pelican as Vulnerable (VU) and Dalmatian Pelican – Endangered (EN). Dalmatian Pelican is also classified on the IUCN red list as Vulnerable (VU). ტერიტორიის აღწერა / Description of the site: კარწახი საქართველოს სამხრეთ ნაწილში ზღვის დონიდან 1800 მეტრ სიმაღლეზე მდებარეობს. ტერიტორიაზე ვხვდებით კარწახის ტბას ათამდე პატარა კუნძულით. ტბის 1/3, საზღვარს მიღმა, თურქეთში მდებარეობს. სანაპიროს მცენარეული საფარის დიდი ნაწილი ისლით (Carex juncella, C. tristis, C. lasiocarpa, and C. vesicaria), შვიტათი (Equisetum flaviatile, E. paluste), ჭილითა (Juncus effuses) და ლერწამქუჩითაა (Festuca varia) წარმოდგენილი. ტბის სამხრეთ-აღმოსავლეთი ფერდობი ტყითაა დაფარული, სადაც ძირითად სახეობას ლიტვინოვის არყი (Betula litwinowii) წარმოადგენს. (Kvachakidze 2010). ორნითოფაუნა იხილეთ http://aves.biodiversity-georgia.net / Kartsakhi SPA is located in the Southern part of Georgia at an altitude of 1800 meters. There are 10 small rocky islands on Lake Kartsakhi. 1/3 of the lake lies in Turkey. Dominant plant species of the lake are Sedge (Carex juncella, C. tristis, C. lasiocarpa, and C. vesicaria), Horsetail (Equisetum flaviatile, E. paluste), Common Rush (Juncus effuses) and Meadow Fescue (Festuca varia). Patch of birch (Betula litwinowii) forest can be found on the South-eastern bank of the lake (Kvachakidze 2010). See http://aves.biodiversity-georgia.net for Avifauna. მეთოდის აღწერა / Description: ვარხვების ორივე სახეობას კარწახის ტბაზე, წელიწადში ორჯერ, მაისსა და აგვისტოში აღრიცხავთ. კარგი ხედვისთვის ფრინველებს ტელესკოპითა და ბინოკლებით შემაღლებული ადგილიდან ითვლით. თითოეული სახეობისთვის, ზრდასრულ ინდივიდებთან ერთად ახალგაზრდების რიცხოვნობასაც ინიშნავთ. აღრიცხვა კარწახის ტბაზე, მადატაფის, ბუღდაშენისა და ხანჩალის ტბებთან კოორდინაციაში ხდება. სათვლელი წერტილი იხილეთ რუკა 1-ზე. / Counts of both pelican species should take place in May and August. For good visibility, the lake is scanned from elevated place with binoculars and scope. Young and adult birds should be counted separately for both species. 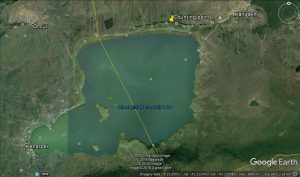 Counts on Lake Kartsakhi should be coordinated with Madatapa, Bogdasheni and Khanchali Lakes. Counting point see Map 1. Crex crex Corn crake ღალღა BB LC ?